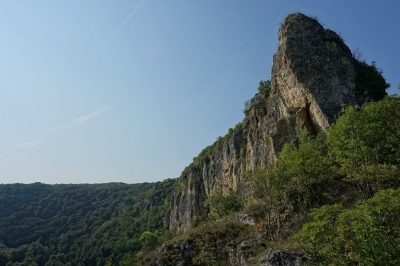 The Roussensky Lom National Park is part of the Tentative list of Bulgaria in order to qualify for inclusion in the World Heritage List. Several state parties maintain misleading and duplicate entries to existing sites on their tentative list. The Roussensky Lom National Park is one of them. When planning our 2018 meetup we were studying all the WHS and TWHS along the way and couldn't quite place this one. So a WHS vanguard consisting of Ian, Philipp, Thomas and myself got up early to check this out before meeting up with the rest and visiting the Rock Hewn Churches of Ivanovo. On our maps it seems that this is a distinct site from the Rock Hewn Churches of Ivanovo. Actually it isn't. The churches are inside of the National Park. The parking area for Ivanovo was already in the boundaries of park. To me only conceivable as an extension to Ivanovo. This is the same thing. But I am hard pressed to see much OUV here. But the same applies to the rock hewn churches. If you made it to Ivanova, you are in the National Park.